For the first-timers, the premise of Paper Chef is that you create a dish using these four ingredients and each month another set of four ingredients are chosen. 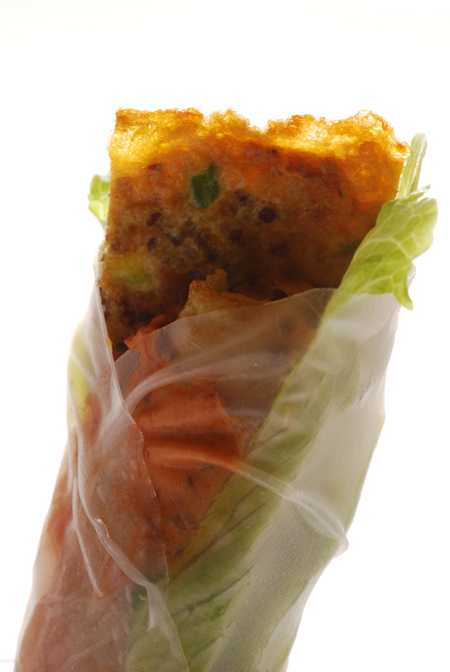 Immediately, when I saw Rice Paper I starting thinking along the line of some kind of wrap. Quinoa proved to be a bit of a sticking point, you couldn't just stuff the wrapper with quinoa, it would just dribble out. So I needed to think of something that would bind the quinoa and the solution came in the from of eggs. I've had rice paper rolls in the past that have used omelets as part of their filling - so for this recipe, I've made a quinoa omelet. The rest of the dish came together quite quickly. 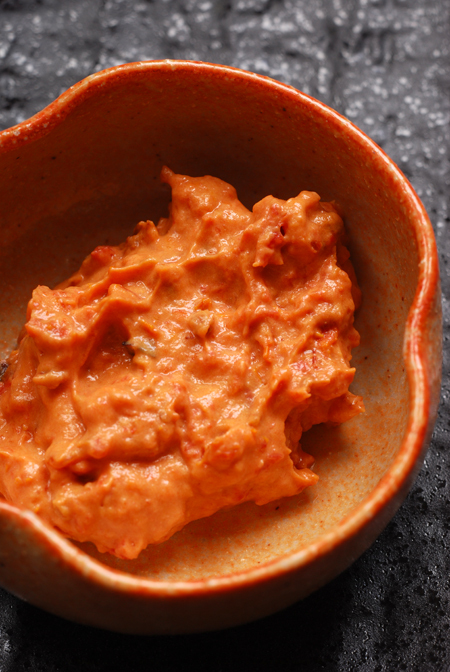 As a nod to the traditional accompaniment of sweet chilli sauce I've made a roasted baby tomato and yoghurt sauce, gently spiced with roasted chilli. I do take a minimalist approach with Paper Chef - I try to limit the use of extra ingredients because I want to really focus on the key ingredients. Once again, taking inspiration from mainstream rice paper rolls, I've used crisp iceberg lettuce leaves and fresh picked coriander (cilantro) leaves to complete the dish. Arrange the halved tomatoes and chilli, cut side up, on a baking paper lined tray. Drizzle with a spoonful of oil before sprinkling over with freshly ground sea salt. Bake in a 150°C/300°F oven until the tomatoes have shrunk and have lost most of their moisture. The time taken depends on the size of the tomatoes. Let them cool before proceeding. Place the tomatoes and chilli into a blender and process until roughly mashed. Add in the yoghurt, a tablespoon at a time and process again until it reaches your preferred consistency. I left my sauce a bit of the thicker side. Set to one side until ready to make the rolls. 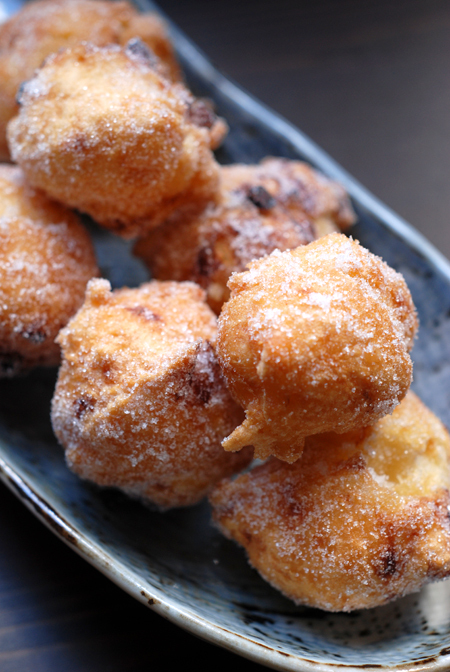 Break the eggs into a bowl and sprinkle over with a little salt - lightly whisk with a fork. Stir in the quinoa and spring onions. Heat a little oil and a small knob of butter in a non-stick skillet and when the butter has melted, pour in the egg mixture. When the bottom has sealed and the top has almost dried, slide out onto a large plate and then return immediately to the pan, flipping it onto the uncooked side. Once this side has browned, slide it out onto a chopping board. You need to have a large bowl of tepid water. 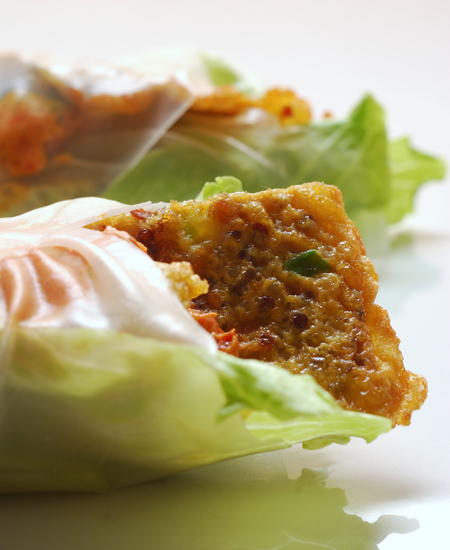 Take one sheet of rice paper and place in the water - leave it there until the rice paper has softened. Remove the sheet and place on a tea-towel, this will remove the excess water. Pat the top side dry with another towel. Lay a shard of iceberg lettuce on the sheet - place it in the center, it should be about three-quarters of the sheets diameter. Sprinkle a couple of coriander leaves onto the lettuce and then place two large fingers of omelette on top. Drizzle with the sauce and finish with a few more coriander leaves. 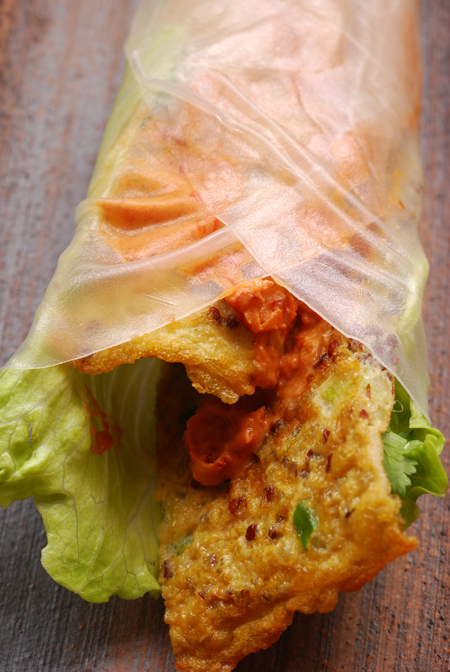 Fold over the bottom quarter the rice paper over the filling and then draw in the sides to form a tight cylinder. Repeat the process until the ingredients have been used - you should be able to make about 8 rolls. This would be well suited for a lunch - the ingredients certainly do all work together. The tomatoes are upfront, the flavours enhanced by the slow roasting while the yoghurt works to round them out and stop them from dominating. The crunch of the lettuce contrasts with the wrapper and the omelette. 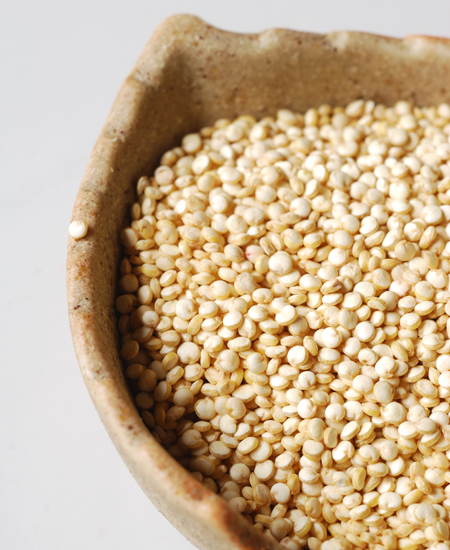 The quinoa, though held in place by the egg, still manages to add its distinctive presence. Oh, MAN. Delicious looking -- and what a challenge!!! Those ingredients come from different food traditions entirely! Hadn't heard of Paper Chef before - very cool. Thanks T - you should visit the Paper Chef site and check out the previous months and join in the fun! Thanks Cmoore - i really couldn't be happier with the way these came together, I'll certainly be repeating them in the future. 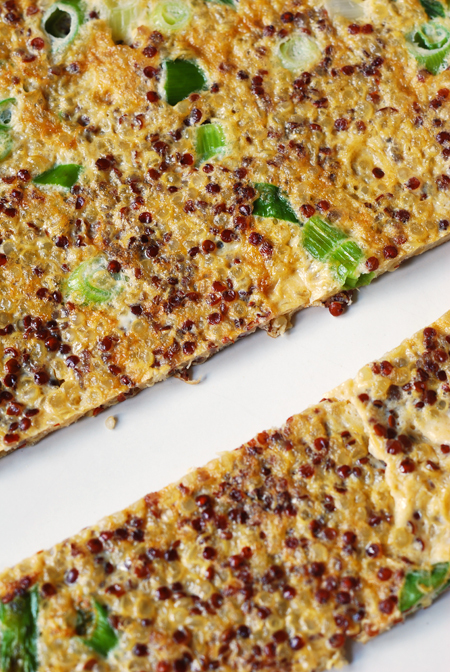 I haven't had quinoa before, but that quinoa omelette looks SOOO PRETTY! This dish really made my mouth water! What a creative take on the Paper Chef challenge! This combination is simply genius! i love it! i've had this packet of rice paper in the cupboard for ages, not knowing what to do with it after i made some vietnamese spring rolls ages ago, now i do! 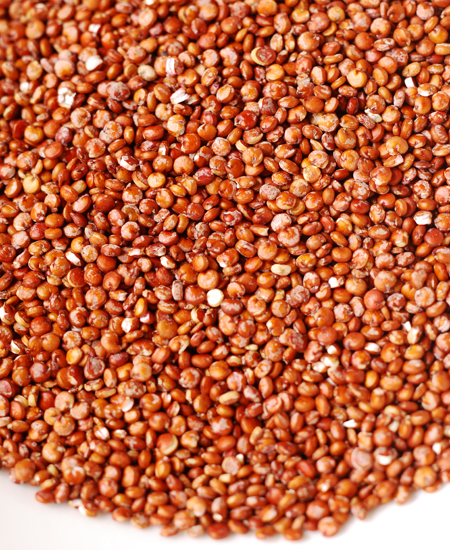 and i always look for new ideas for quinoa, as it's such a healthy grain, so your idea is just perfect, thank you! Very, very nice! I still have to try quinoa. Thanks JS - i'm really pleased with the omelette, there's a nice nutty element to it from the quinoa. Thanks Heart - hope you enjoy it! I love the photos too, and your red bowl near the end. Sound like excellent seasonings. Excellent idea with the omelet and I love that you wrapped it all in the lettuce! Quinoa omlette - Very different but looks mouth watering!! well done! Thanks Kikitri - you are too kind!